Make Your Own Mantra Workshops! 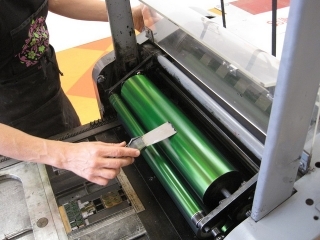 Interested in learning about letterpress printing? Sign up for a Make Your Own Mantra workshop! There are two this summer, and one is next week! There are only two spots remaining for the July 16th workshop! Learn the basics of setting and printing type on a letterpress printer. Bring a phrase or mantra less than ten words, learn to compose it on a type stick, place in the bed of the press, and PRINT! We will print on paper that you bring from home as well as paper that we provide. Check out our Upcoming Events page for the sign-up form – we hope to see you there! Previous post ← Self-Folding Paper? !